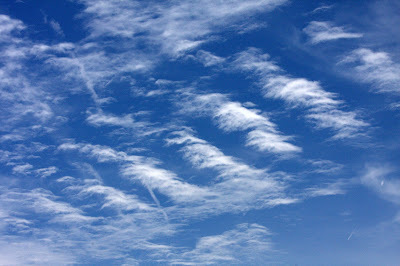 Thin whisps of clouds appeared as a cold front moved two days of rain out of the area. Soon the heat and humidity of a mid-Atlantic coast summer will make blue skies and thin whispy clouds a rarity. Canon 40D, 1/400 sec at f/22, ISO 100, 70mm focal length.